← Church for the Next Christians … Community or Mission? How Do We Relate Science and Religion? 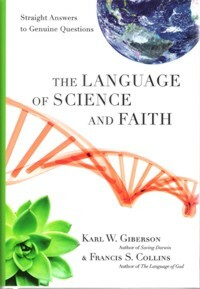 I recently received, compliments of the publisher, a copy of a new book by Karl Giberson and Francis Collins The Language of Science and Faith: Straight Answers to Genuine Questions. This book has its origins in the avalanche of questions unleashed on Collins following the publication of his earlier book The Language of God. But this new book is not an encyclopedia of frequently asked questions – it is a readable book walking through many of the frequently asked questions and the important issues in a narrative form. It is written for the non-scientist and will make a good resource for those with questions, for discussion groups, and for church leaders. In chapter three The Language of Science and Faith turns from scientific issues – the evidence for evolution and the evidence for the age of the earth – to address the question of the relationship between science and religion. The Christian faith and science are often understood as at war, in necessary conflict with each other. The conflict model, however, is more fiction than fact. Most of science has no bearing whatsoever on religion and most religious thinking addresses concerns outside of the realm of science. This realization has led to a second approach commonly labeled as non-overlapping magesteria or NOMA where science deals with facts about the material world and religion with values and morals. The view of non-overlapping magesteria too limiting though – it does not do justice to science, to religious faith, or to the areas where the two do come into contact. In reality science informs our religious faith and religious faith shapes our understanding of science. It should be this way, it has to be this way. Can religion contribute to science? Can science inform religion in helpful ways? How do we know when we can adopt a new understanding of scripture? One of the most controversial assertions – at least in a Christian audience – is that science can and should take a role in informing our faith and our understanding of scripture. It feels as though science is in the drivers seat and religion must conform. Yet science must inform our understanding of scripture. Not because materialism and modernism trumps the supernatural and revelation, but because God is the creator. All science does is explore and seek to understand creation. When a person, scientist or non-scientist, dismisses God from the picture, it is not for scientific reasons. There is a philosophical assumption in the dismissal. Science, like the science at the root of the dispute between Copernicus, Galileo, and the church, will offer a refinement to proper understanding of scripture. Psalm 93 states that “Indeed, the world is firmly established, it will not be moved.” Psalm 96:10 in another creation passage repeats the theme: “Say among the nations, ‘The LORD reigns; Indeed, the world is firmly established, it will not be moved; He will judge the peoples with equity.‘” These passages cause little concern today, yet they caused consternation when it was discovered that the earth, in fact, does move. Science has informed our reading of these passages and our reading of many other passages as well. Obviously a surface meaning of many passages could be tested, for example, against archaeological discoveries, and the meaning of others can be enriched by scientific and historical knowledge. But I want to suggest that the primary function of scientific enquiry in such fields is neither to verify nor to add to the inspired picture, but to help us eliminate improper ways of reading it. To pursue the metaphore, I think the scientific data God gives us can sometimes serve as his way of warning us when we are standing too close to the picture, at the wrong angle, or with the wrong expectations, to be able to see the inspired pattern he means it to convey to us. The ancient “science” in the text – from misclassification of animals to the assumption of a stationary earth, and more – is incidental to the intention of scripture. The Bible is not and never was intended to be a text revealing such details about the world. Modern science is not in the text. We should not take the text of scripture literally as a science text – not by assuming that ancient “science” must be correct, whether cosmology, biology, astronomy, or medicine, or by discovering modern science hidden in the text. There is no modern science encoded supernaturally in the text and we misunderstand the nature of the text when we expect to find it. In fact, reading a current understanding into the text is one major source of subsequent conflict. Science does not inform our reading of scripture or our faith by confirming the reliability of scripture or by proving the existent of God. It does not reveal hidden messages or meanings in scripture. However, our improving understanding of the world does help us separate genre and form in scripture. It helps us dig into scripture and understand the message and intent. How do we know when we can adopt a new understanding of scripture? The remainder of this chapter discusses approaches to scripture that can help make sense of the text with a robust understanding of the intended and inspired message. The reader and interpreter must consider things like the nature of the text, its genre, the expected audience, the purpose, and relevant related knowledge including analysis of the language, examination of word usage, and comparison with related texts from other sources. If certain forms, say hyperbole, or stylized genealogies for example, are common in other sources, we can expect them to be used in scripture as well. This is part of the expected form for the original audience, used to convey the inspired message. With respect to Genesis 1-2, the simple observation that we have two creation accounts that differ in detail in important ways provides an important clue to their form and intent. What do you think? Can science inform religion in helpful ways? How do we know when we can adopt a new understanding of scripture? When do we need to listen carefully to tradition? This entry was posted in Bible, Science and Faith and tagged Francis Collins, Science and Faith. Bookmark the permalink.